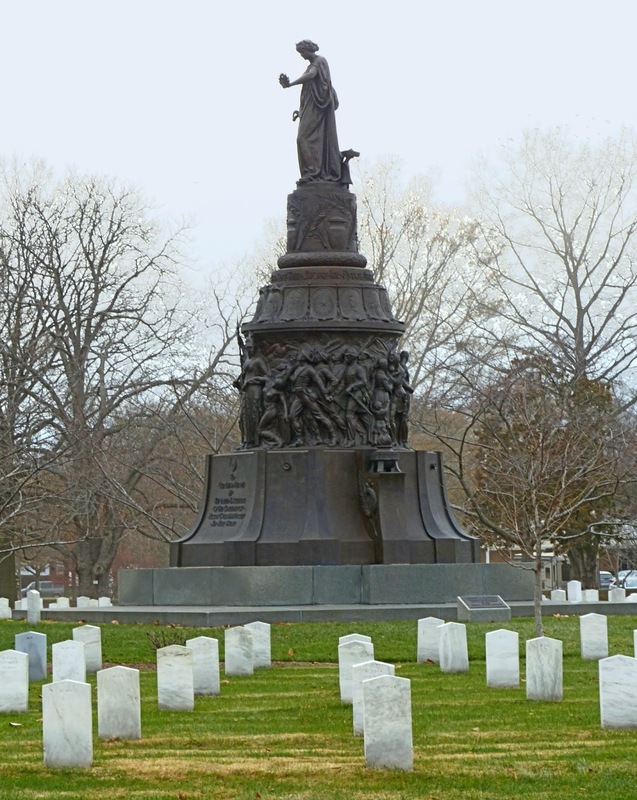 The confederate monument in Arlington National Cemetery was unveiled on Jefferson Davis' birthday in 1914. In 1900, Congress authorized that a section of Arlington Cemetery be used for the burial of Confederate dead. By 1901 all the confederates buried in the national cemeteries in Alexandria and at the Soldier's Home in Washington were re-buried here. 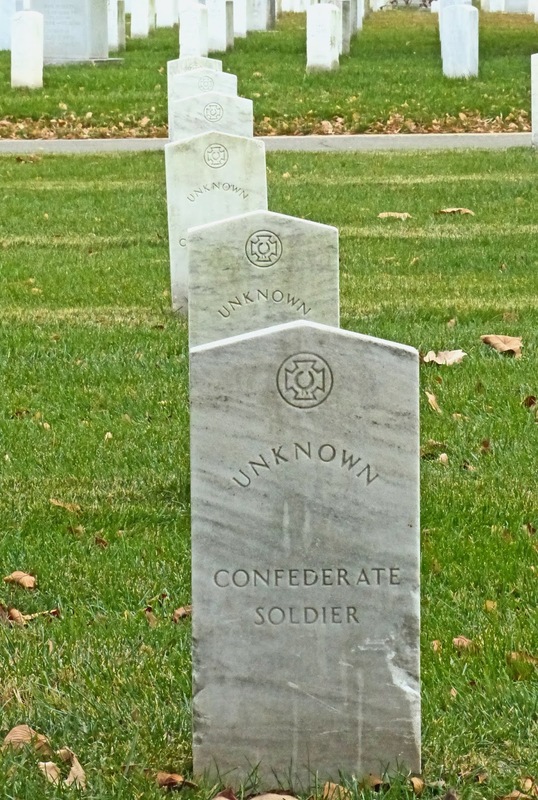 "Among the 482 persons buried there are 46 officers, 351 enlisted men, 58 wives, 15 southern civilians, and 12 unknowns. 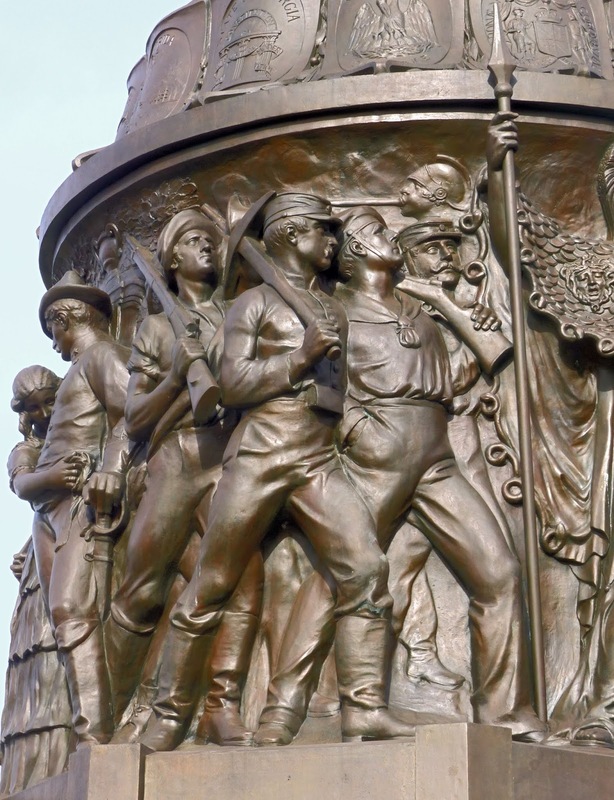 They are buried in concentric circles around the Confederate Monument, and their graves are marked with headstones that are distinct for their pointed tops." 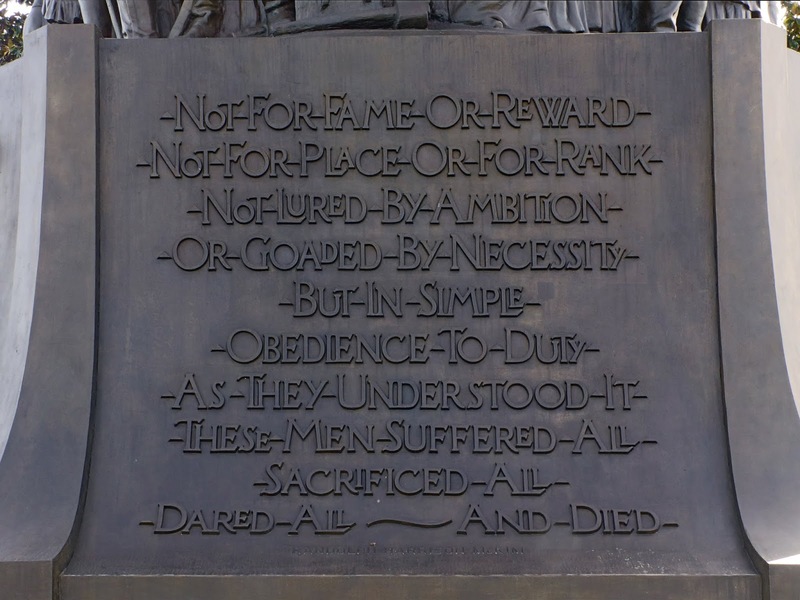 -- Arlington National Cemetery. 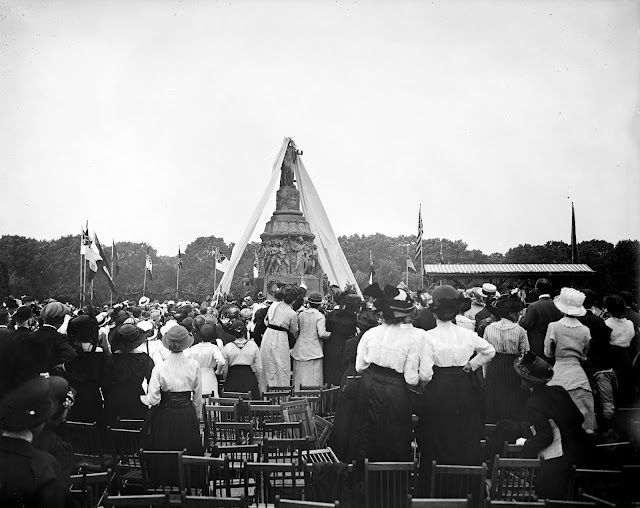 This library of Congress photo shows the unveiling in 1914. "This Chapter in History is Now Closed." 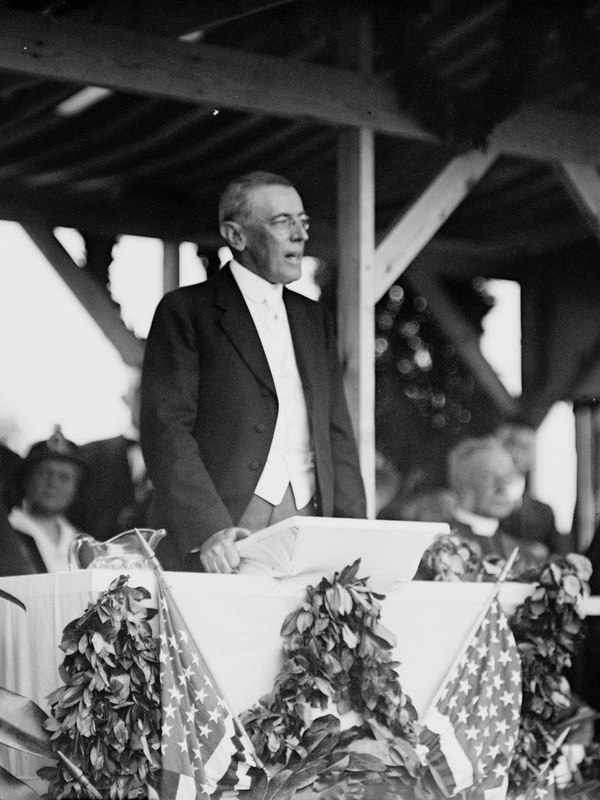 Woodrow Wilson offered these remarks: "I assure you that I am profoundly aware of the solemn significance of this thing that has taken place. The Daughters of the Confederacy have presented a memorial of their dead to the government of the United States... My task is this, ladies and gentlemen: This chapter in the history of the United States is now closed, and I can bid you to turn with me with your faces to the future, quickened by the memories of the past, but with nothing to do with the contests of the past, knowing, as we have shed our blood on opposite sides, we now face and admire one another." 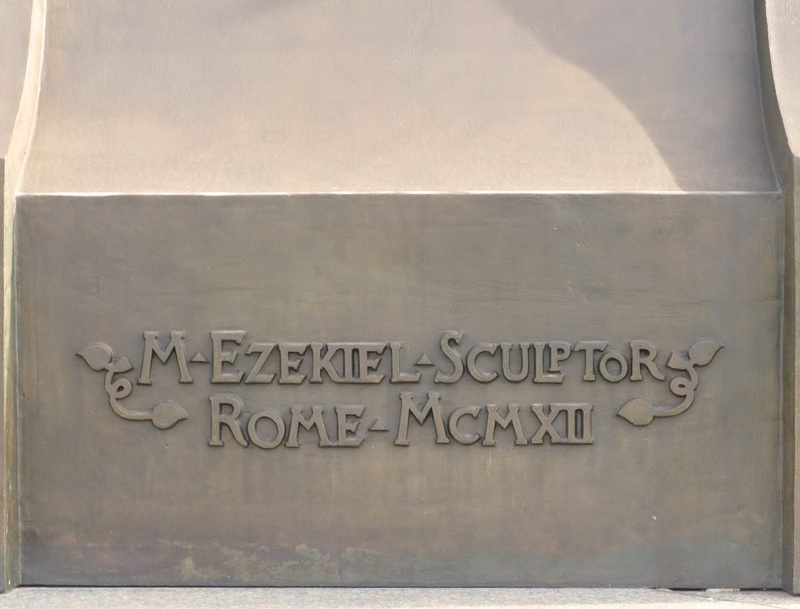 -- Washington Post, June 17, 2007. 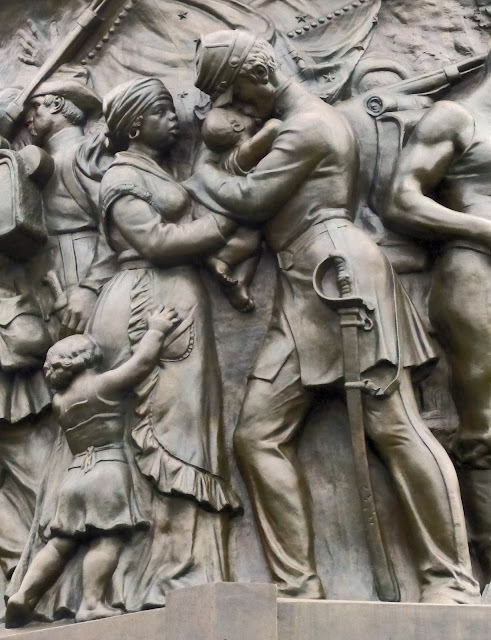 Many "Lost Cause" monuments were constructed in the early 20th century when the white people of America were able to reconcile after the "the late unpleasantness" at the expense of black Americans who were increasingly discriminated against in what came to be called called "The Jim Crow era." 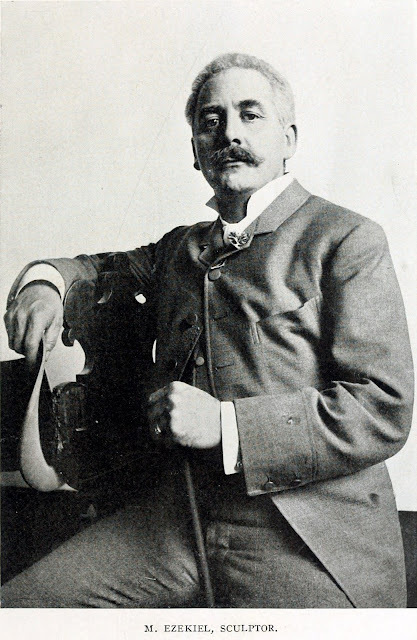 Wilson himself re-segregated the federal bureaucracy in this era, and segregated the Navy for the first time. 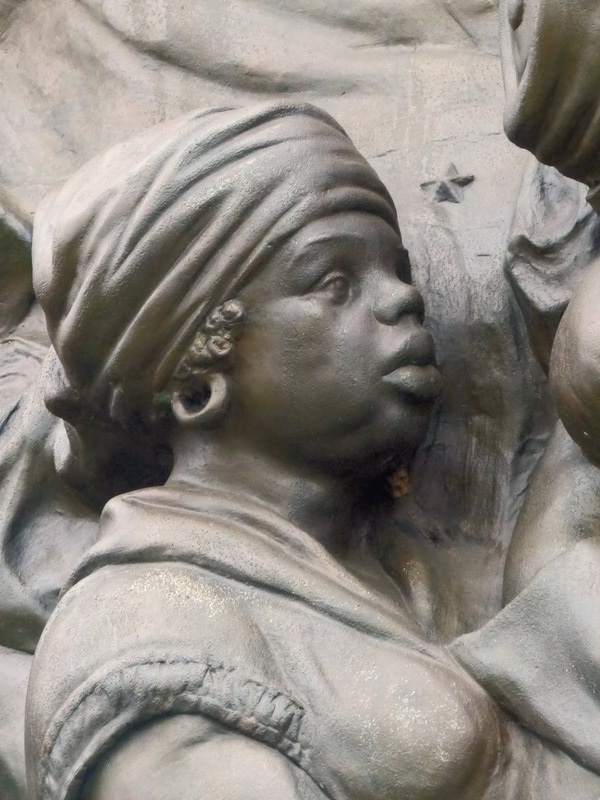 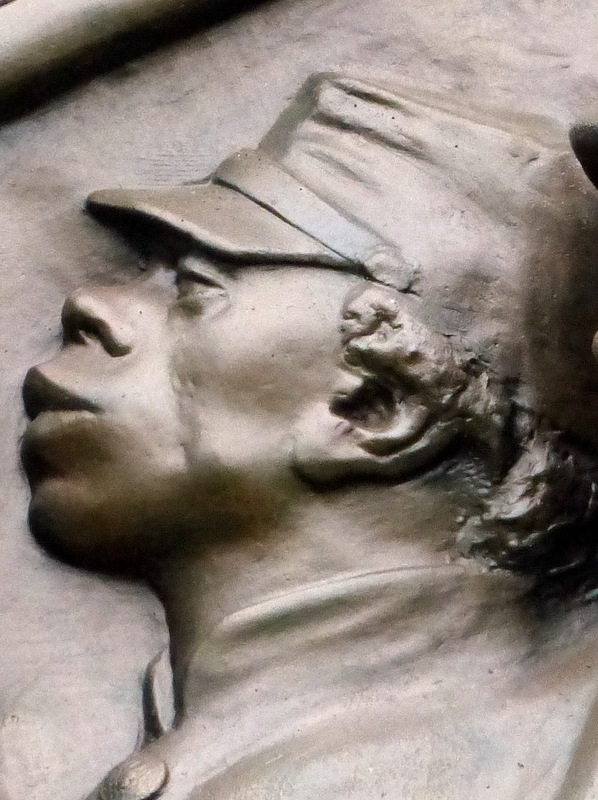 The Iconography of the monument as designed and sculpted by Moses Ezekiel is rich and complex. 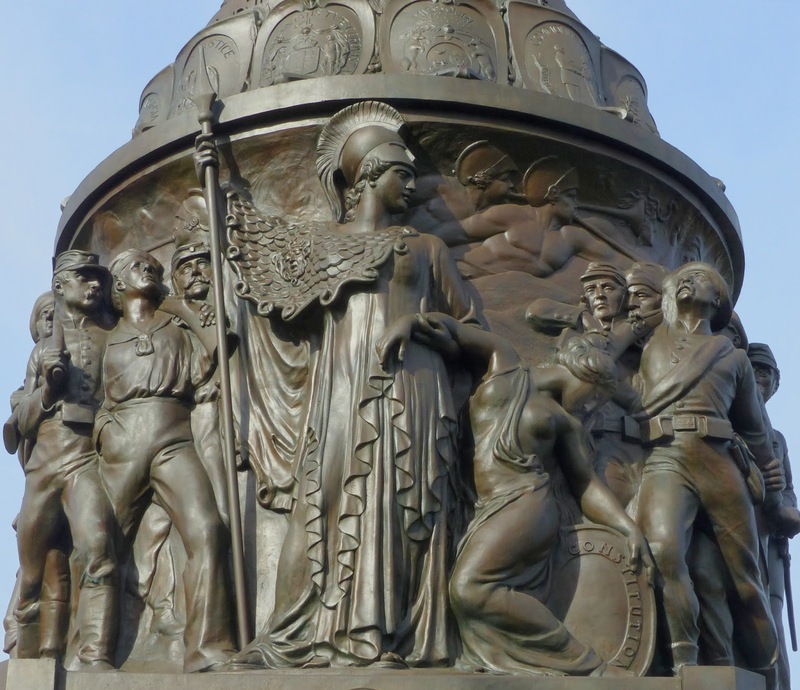 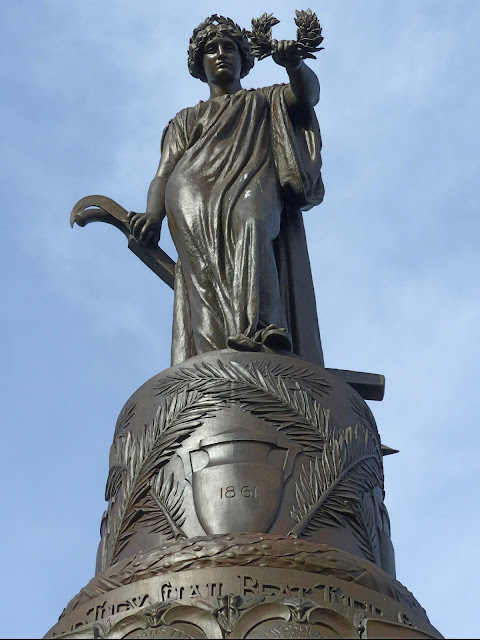 The monument is topped by an allegorical statue of a woman representing The South. 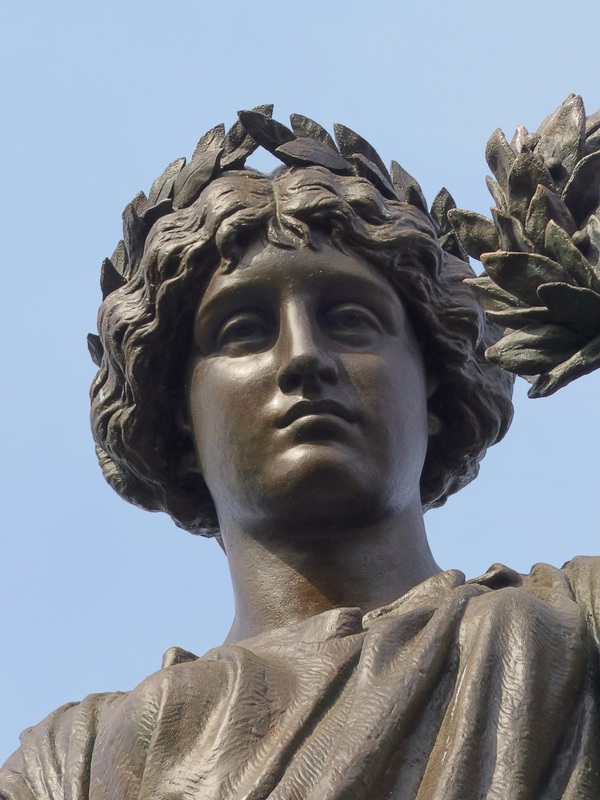 "Her head is crowned with olive leaves, her left hand extends a laurel wreath toward the south, acknowledging the sacrifice of her fallen sons. 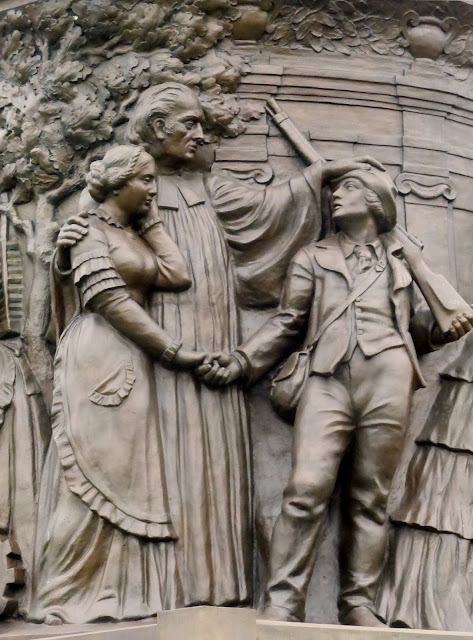 Her right hand holds a pruning hook resting on a plow stock. These symbols bring to life the biblical passage inscribed at her feet: 'And they shall beat their swords into plow shares and their spears into pruning hooks.'" 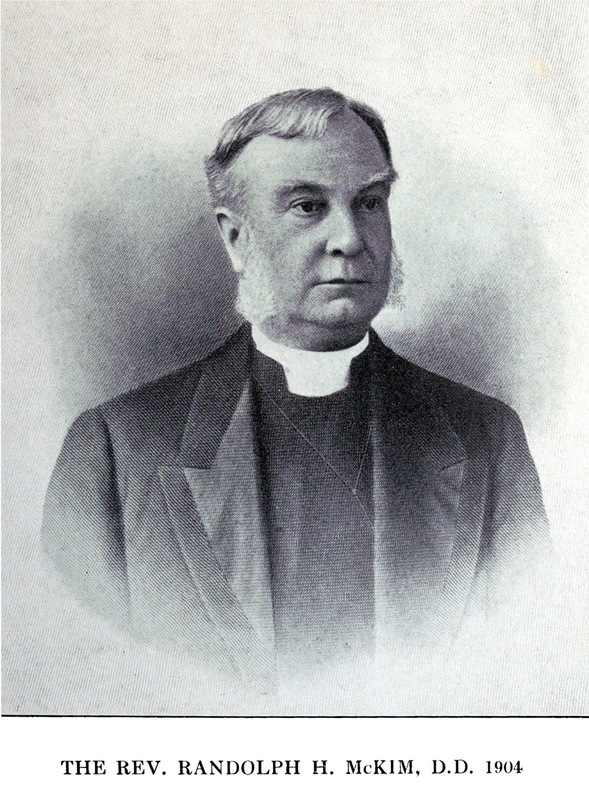 -- ANC. 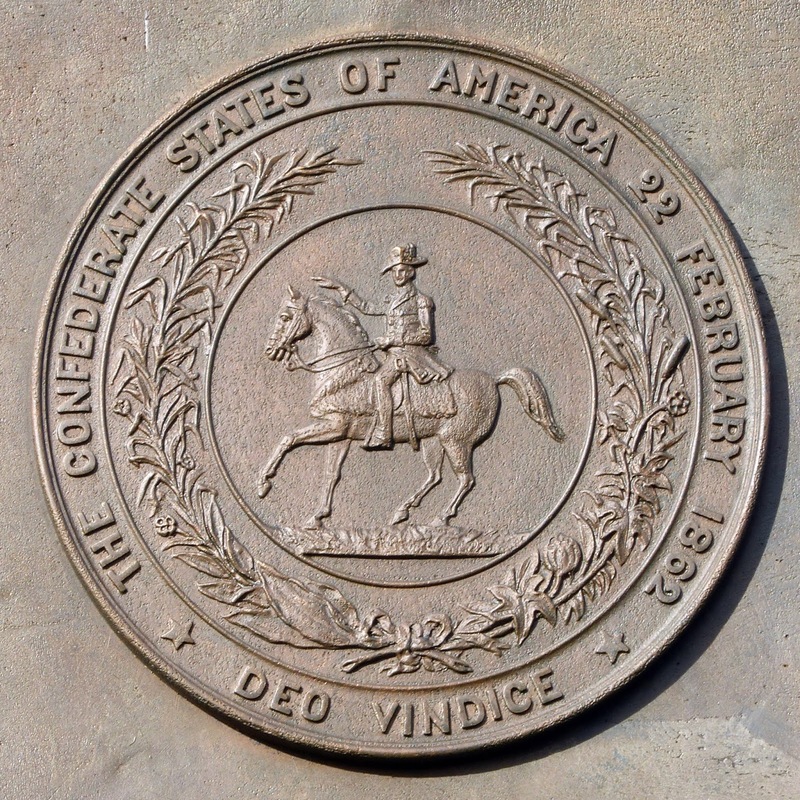 On the pedestal on the south face of the monument is the seal of the Confederacy and a dedication. 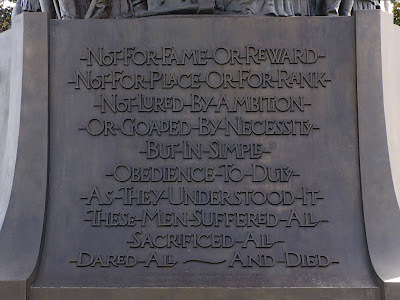 The Latin adapted from Lucan's poem Pharsalia meanings something like "The winning cause pleased the gods but the losing cause pleased Cato", indicating that the winning cause was fortunate but the losing cause was more just. A frieze below the statue depicts a mix of allegory and genre scenes. 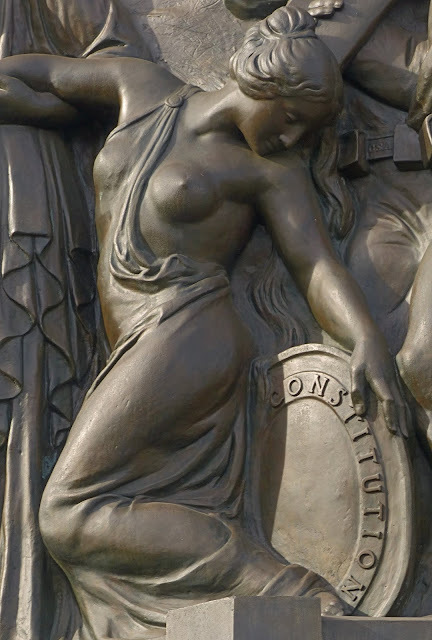 On the south face we find an image of Minerva the goddess of War and Wisdom helping to support a swooning woman who represents the fallen South leaning on the Constitution. 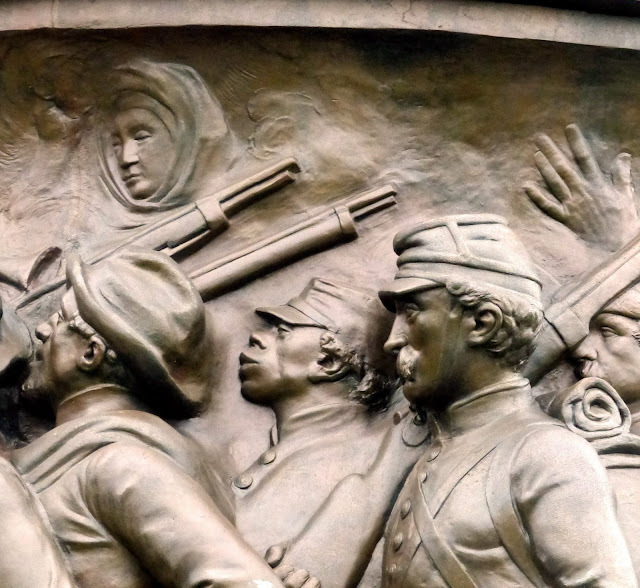 Soldiers, Miners and Sailors march off to join the cause beneath "the Spirits of Avar" blowing their trumpets. 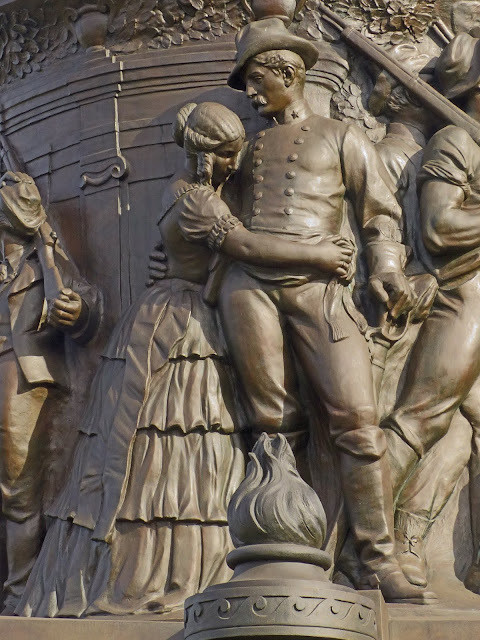 A young woman ties a sash around the waist of her lover who is leaving for the war. A minister and his wife bless their son who is leaving home to go to war. 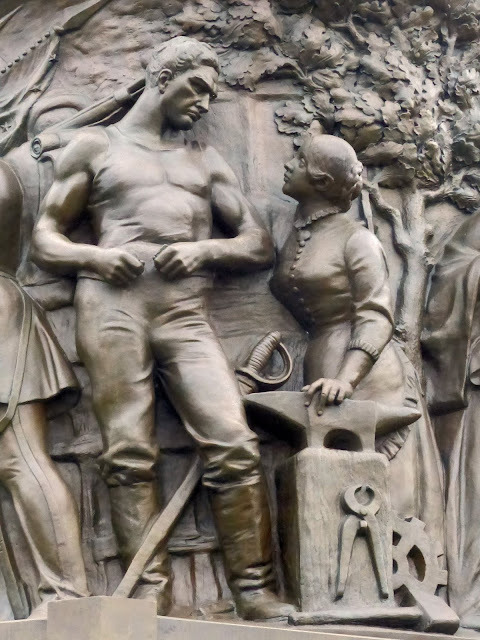 A blacksmith's wife upbraids him and urges him to join the cause. A Young soldier kisses his infant child held up to him by an enslaved African American servant, while an older child cries on her skirts. 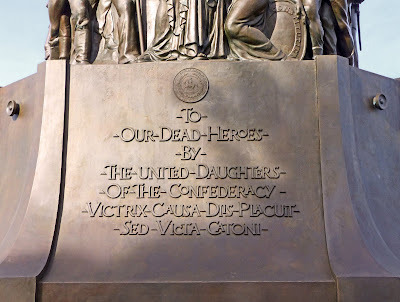 On the back (northern) side of the pedestal is an inscription signed by Confederate chaplain Randolph Harrison McKim. McKim had been Chaplin of the 2nd Virginia Cavalry and was later pastor the Church of the Epiphany in Washington, DC. The Monument is signed by sculptor Moses Ezekiel. 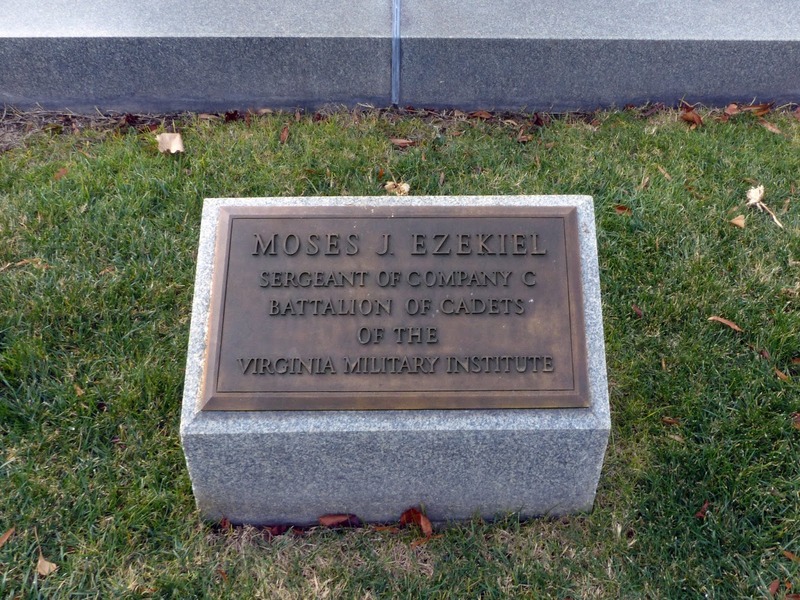 Moses Ezekiel's dying request was to be buried near his sculpture in Arlington Cemetery. 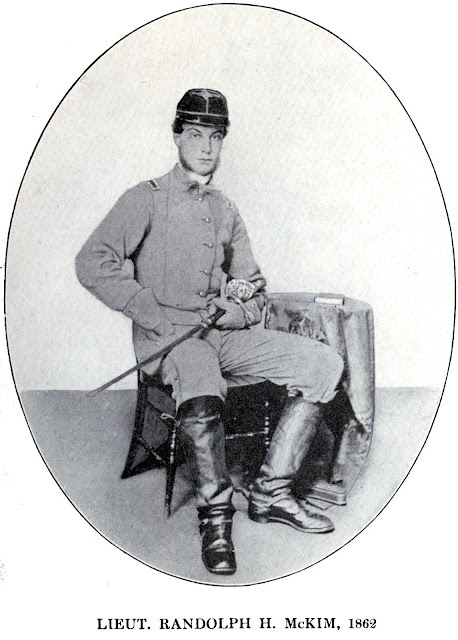 He was not actually a Confederate soldier but he was a graduate of the Virginia Military Institute and had fought at New Market. 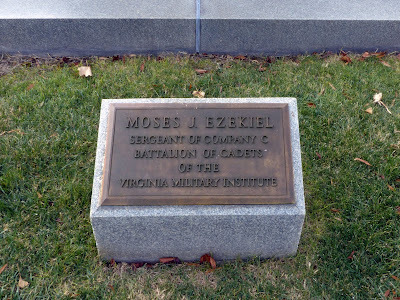 In 1921 his body was returned to the U.S. and buried here. His funeral was held in the Memorial Amphitheater. On the band between the Statue of Peace and the frieze are 14 state seals. There were 13 states of the Confederacy, if you count both Kentucky and Missouri. 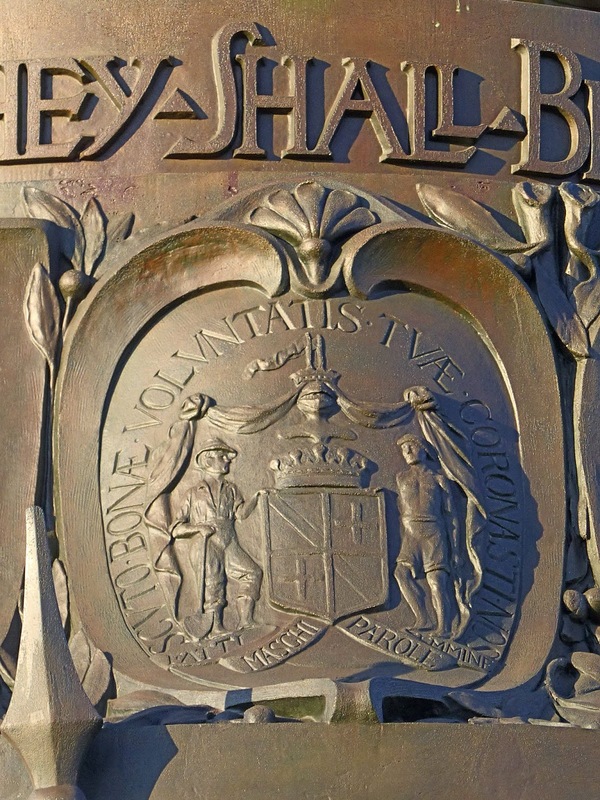 The fourteenth is the seal of Maryland. 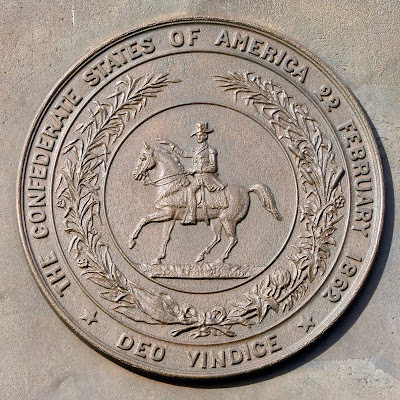 Though not a Confederate state Maryland supplied men and support for the Confederate cause.